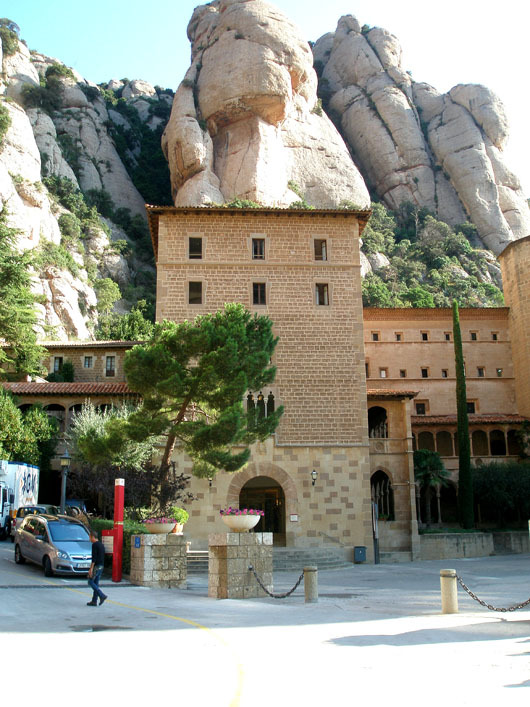 The folklore is reason enough to visit the Benedictine monastery of Santa Maria de Montserrat near Barcelona. Like the fantastic claims of this being the ‘Castle of Munsalvaesche’ where the Holy Grail is believed to be hidden! Or those of miraclulous occurences in 890 AD, that led shepherd boys to the ‘La Moreneta’ (the little dark skinned one), a statue of the Black Virgin with baby Jesus! But the awe inspiring, jagged surface (hence the name) of this mountain range and the breathtaking vistas all around, weave their magic even before you reach that hallowed space! 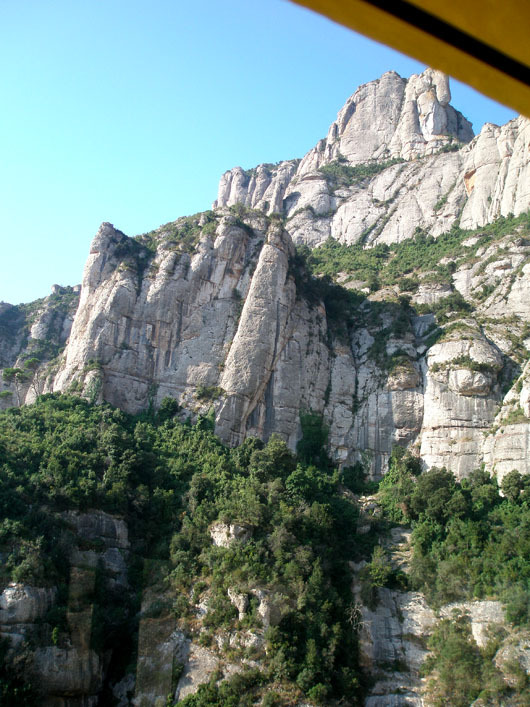 It takes an hour long train journey (on the R5 line from estacion Espanya in Barcelona) and a short aerial cable car ride up from the Aeri de Montserrat station (or – for the faint of heart – a slightly longer cremallera train from the next stop), to get to the monastery, perched a little over half way up the mountain. The rush of pilgrims and tourists apparently ruin the experience a bit, but we lucked out (again!!) and had it nearly to ourselves, early on this August morning. A funicular goes down to the the sacred cave where the La Moreneta was discovered. Another climbs up about 800 feet, from where one can hike to the crest, and succumb to the glory of the Catalonian landscape! 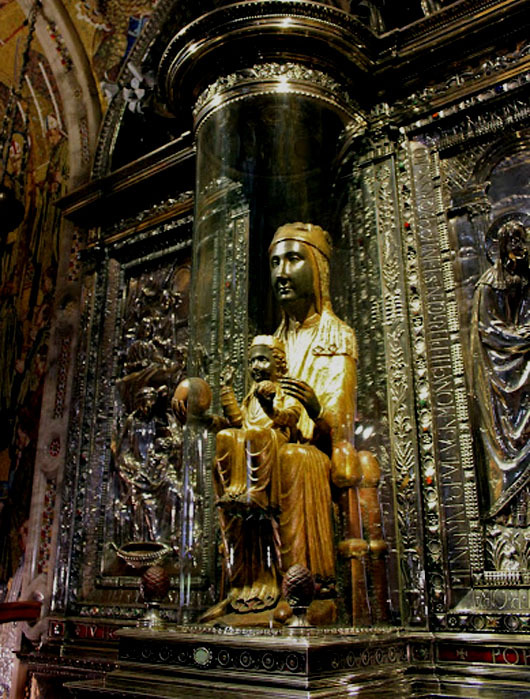 The present statue of the Black Virgin of Catalonia, housed in a glass enclosure inside the Abbey, is a 12th century Romanesque reproduction and the jury is out, about why it is black. The most commonly accepted reason is that the wood sculpture has darkened over centuries from the soot of innumerable candles. Paying homage to the unbroken chain of tradition through the ages, we caressed the Madonna’s golden orb and listened to the wonderous boy’s choir – L’Escolania – sing hymns in praise of their patron saint……. Thank you! That little train station nestled in the mountains is my favourite as well! Sounds a wonderful place to visit. Amazing location! Wonderful pics, Madhu. Thank you for sharing. There is so much to see in Spain. I obviously didn’t even scratch the surface. They are even more so in reality! Thank you for reading! Gotcha! But there’s a difference between the heaving masses participating in temple rituals, and a couple of bus load of tourists following their umbrella wielding guides strangling a handful of unintelligible languages. And they’re always standing up clue, right in front of the pictures! No sweat! We ended up eating breakfast in a very traditional ‘mess’ near the temple that was an experience in itself! Next year perhaps, God willing 🙂 Thank you for reading! What amazing wonders are created by the forces of nature – these mountains are an incredible display of what the elements can do. And the monastery an equally incredible display of that man can do. Beautiful photos! Thank you Carol! I do not always feel in religious places, the reverence, the presence of God, I feel when I look at natural wonders such as these. Hi Madhu, now I have to put another destination on my to-go list. This place seems really different. On the last trip to Spain, we didn’t get to Catalan. These photos really capture the scale of the mountains, which is difficult to do. Another great post. Thank you so much Naomi! We didn’t get to Catalan on our first trip either. It is rather out of the way. Do try and include the Basque region when you do go. We just managed a day-trip to Bilbao and regretted not having spared a few days for that area. Thanks Ruth! That landscape was truly amazing! Beautiful pictures! When were you in Spain? Barcelona in 2008. We did Southern Spain and Moroccco in 2005. Your photos are gorgeous – particularly that shot of the train station! Absolutely jaw dropping 🙂 Thank you for the visit and comment Anne! Thank you so much Mags! It really is a magnificent place! great stuff, thanks for taking us along on the trip! You are most welcome Derrick! Thank YOU and welcome to my blog! I can imagine how they secured it like that. Not just how it’s made of but the importance and history that goes with it. Wow! train, cable car and a climb. I love it when there are various ways and activities before getting through your destination. Although often painstaking, at least there’s it’s something to talk about. Yes, the journey was even more fascinating than the destination! Thanks for dropping by Rommel! Nice photos! I’m dying to go there, I can’t believe I haven’t been yet. Your post is making me want to go even more! Hope you do Jessica 🙂 Thank you so much for the visit and comment! Oh, Madhu, we visited here about 10 years ago (is it that long already?!) only we arrived by bus. Poor soul in front of us had smoke pouring out the back end of his car before he got to the top. We enjoyed our visit there and the great views over the Lobregat River and valley. It is a wonderful place to visit! It is TBM! Breathtaking really! Great place and photos madhu! Thanks for sharing your great work with so much passion! Great photos and awesome view, especially of the train station. It would be anice place to visit. Yes, it is worthwhile to make time for a few hours in this wonderful place. Thanks Fergiemoto! Thank you again DJ 🙂 Just about catching up with the older comments! So that’s how Montserrat got its name. I wonder if the other Montserrat in the Caribbean also owed its name to such jagged mountain. By the way, it’s so interesting how the story of the holy grail inspired so many people from different regions, including the ones in Catalonia. Beautiful place as well!